Email Forensics Software is a versatile tool to simplify email forensics with accurate results. The software is integrated with proficient features which makes case management task hassle-free for the forensic investigators. Moreover, the utility supports examination of 80+ email clients. 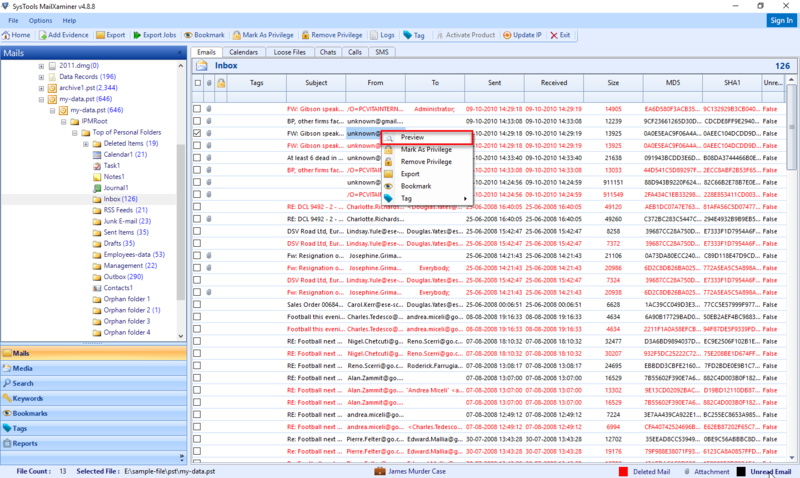 Examine Emails of Office 365, Rackspace, Gmail, iCloud, Live Exchange Server etc. Download and install Email Forensics software and then scan to add files of web-based or desktop based email client to recover pieces of evidence. One can add single/multiple files or complete folder as per the requirements. The Email Forensics utility permits to analyze read, unread, deleted or password protected emails for the forensic investigation purposes. 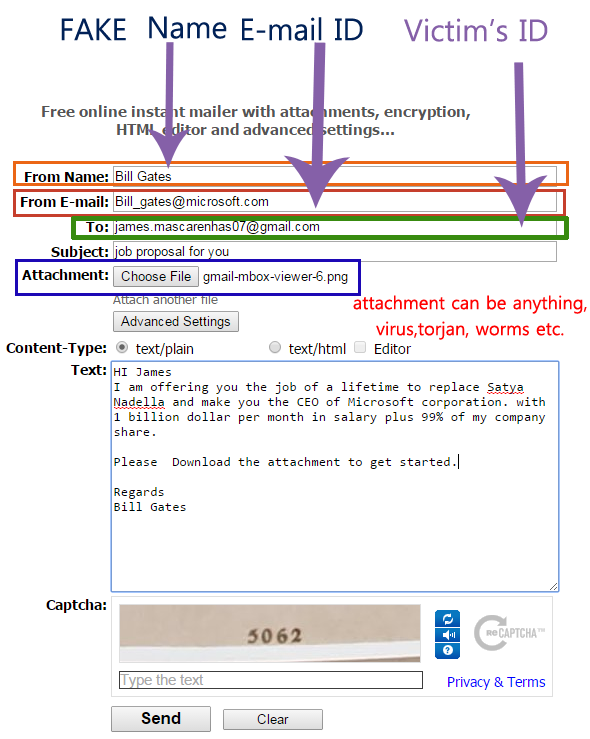 The user can easily examine emails along with attachments in different view modes provided by the tool. After complete recovery and analysis of forensic mail evidence, one can easily export them in different formats. 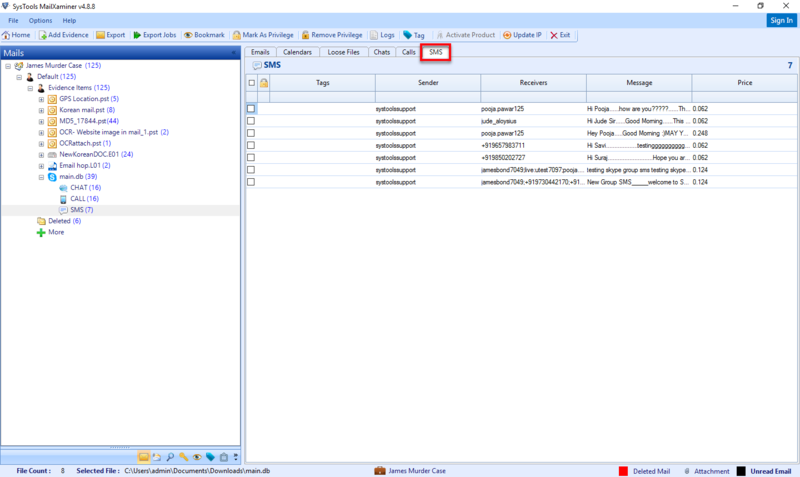 The folder structure of the resultant file is maintained by the tool. Case management is one of the most important tasks when it comes to forensic investigation. 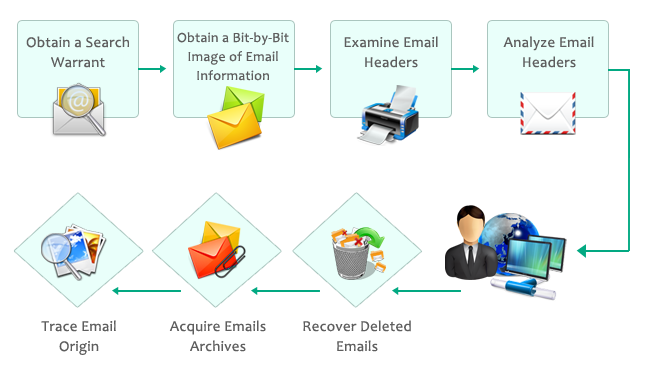 The Email Forensics program provides advanced case management facility such as creating a case repository, scan status, analyze and recover email, log files, bookmarking option etc. This makes the investigation process efficient and faster. The software is designed with advanced features to make the forensic examination seamless for the users. The tool is capable to support more than 20 file types of both desktop-based (Lotus Notes, Outlook etc.) or web-based (Yahoo, Gmail etc.) email clients. Additionally, the tool is also integrated with enhanced artifacts support to examine a wider range of email repositories. 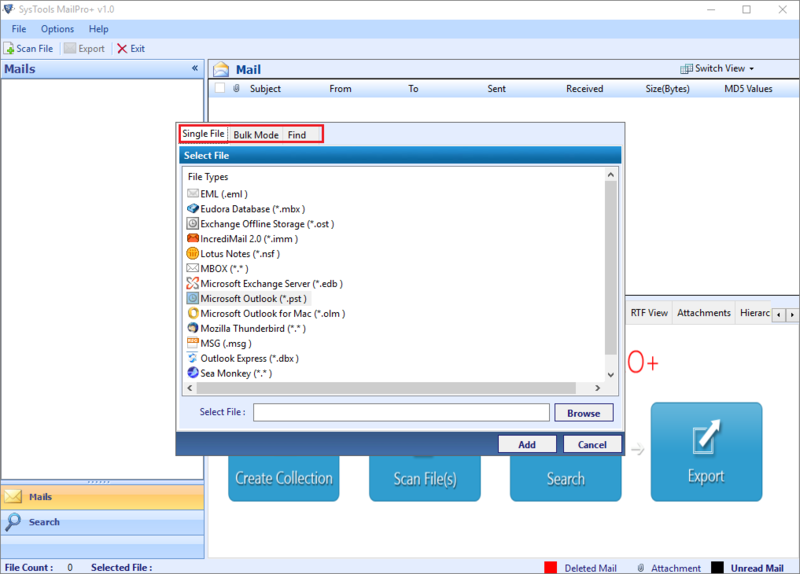 One can easily create custom search filters according to the scenarios. The user can make use of advance cultivated search facility which includes Fuzzy, Regular Expression, Wildcard, Proximity, Stem and other logical search operators. This helps the user to get the accurate results. Moreover, support for multiple languages such as Japanese, French, Korean etc. is also offered by the utility. The utility allows export the available image attachment having GPS locations in KML format. One can also view it using Google Earth. Plus, it also offers enhanced documents support for the document format present within the image files such as E01, DD, LEF, and DMG. It also provides support for GPT Disk image for E01, Zip archived file, LEF process L01 file. The tool provides support to hash function such as SHA1, SHA 265, MD5 during analysis. One can easily view SHA1, SHA 25 etc. hash values of the suspected email. Apart from this, the software also searches in image(s) content with OCR (Optical Character Recognition) process. Email Forensics Tool provides acquisition support for the network that helps investigators to scan files from a Network or Domain. One can acquire and preserve artifacts directly from the network. With advanced link analysis features, it is possible for the forensic investigators to track the direct and indirect communication between multiple suspects. Different email preview modes are provided by the software which makes easy for the forensic investigators to view and analyze email as per the requirements. The tool provides Normal View, HTML View, RTF View, Hex View, MIME View, Property View, Email Hop View, Attachment View. One can easily examine emails of Office 365, Gmail, Live Exchange Server, iCloud, Rackspace, Hotmail via Email Forensics tool. The software supports to download and examine mailboxes of the various platforms in a trouble-free way. After the examination of emails, the user can export emails into multiple formats such as Concordance, CSV, EML, MSG, HTML, TIFF, PST, PDF. This feature is very beneficial for forensic investigators as they need to save all the evidence in a particular format to present them in court. Sometimes, forensic investigators need to work on the same case. To make the group work easy for the users the software offers team collaboration facility which allows multiple investigators to work on the same case without any problem. 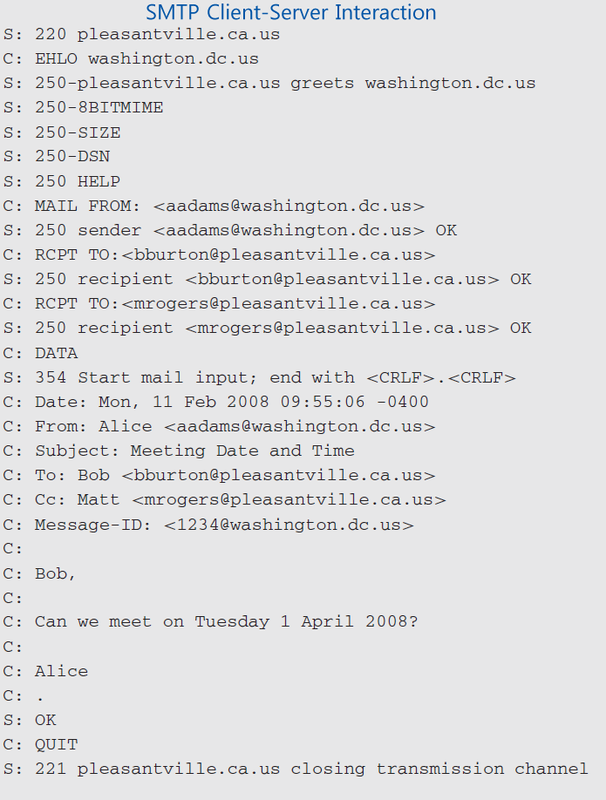 To investigate Skype chats, call records, SMS and carve out evidence from them, the Email Forensics utility provides a unique feature which permits the user to add the Skype database file and view details such as chat message format, sender and receiver details, call records, SMS. After all the examination process, one can export the report with all the details associated with the forensic investigation of emails. 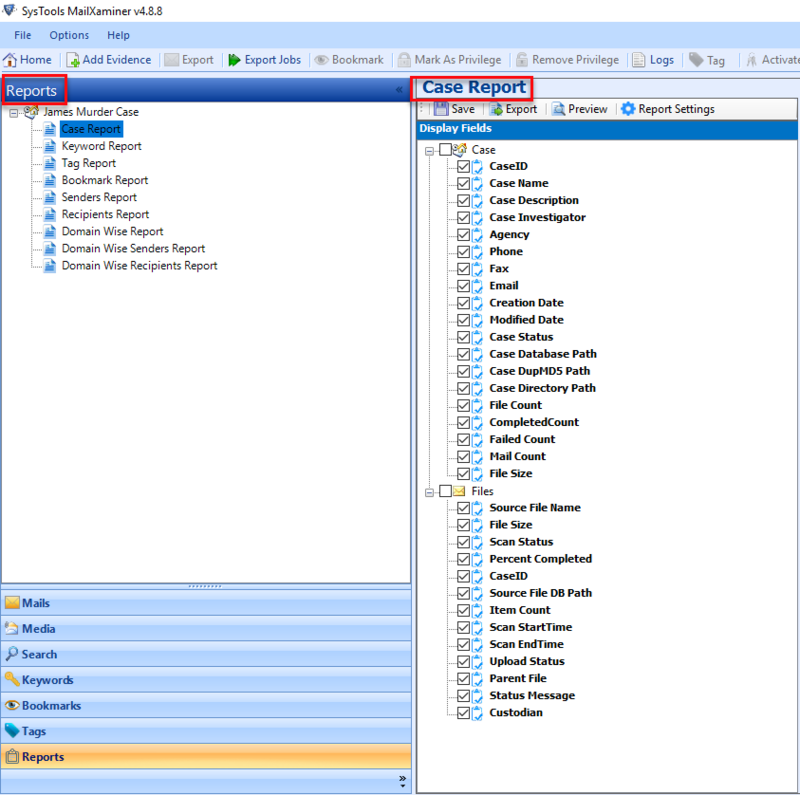 The user can export the reports of the case, tags, keywords, bookmarks etc. Moreover, the tool also permits to export the sender’s, recipients report, domain-wise senders report in HTML, PDF and CSV file formats. Does the Email Forensics tool provide any data filtering option? Yes, the software provides Grid data filter which allows searching without navigating to the search option. Also, it offers more accurate filtering of the data. Can I view Email Hop of a particular email via the software? 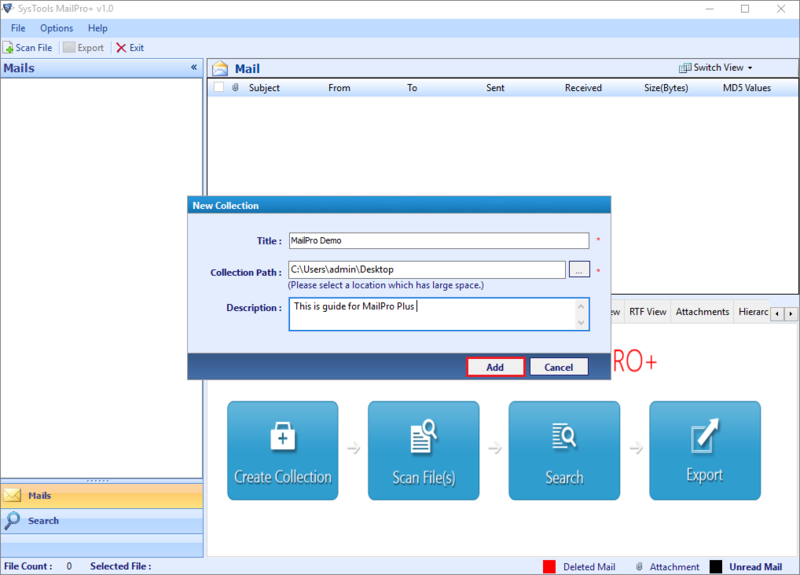 Yes, the tool provides multiple email view modes such as Normal, RTF, Hex, Email Hop, Attachments view etc. So, the user can view email as per the requirements. I need to collect some evidence form the user’s Skype account. Can I extract calls and chats from the Skype database? 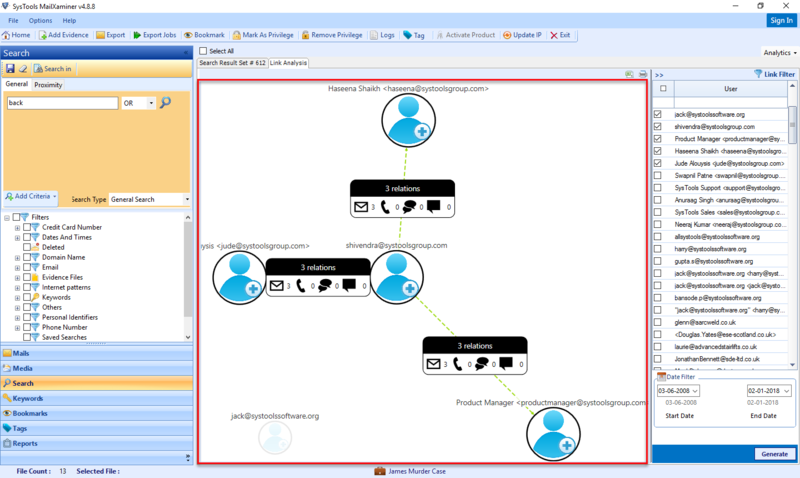 Yes, you can easily extract chats, call and SMS associated with the user’s Skype database and analyze it. Does the Email Forensics software permits analysis of document formats available in ZIP and DD file? Yes, with the help of Email Forensic tool, one can easily examine and analyze all the document formats available in image files such as E01, DMG, DD, LEF and ZIP file. Is there any data loss and security issues associated with the utility? No, there are no data loss and security issues associated with the tool as it is designed with advanced data protection and security algorithms. Can I categorize emails as per my needs at the time of email investigation through Email Forensic software? Yes, the software provides email tagging feature which makes easy for the users to examine particular emails among thousands of emails. 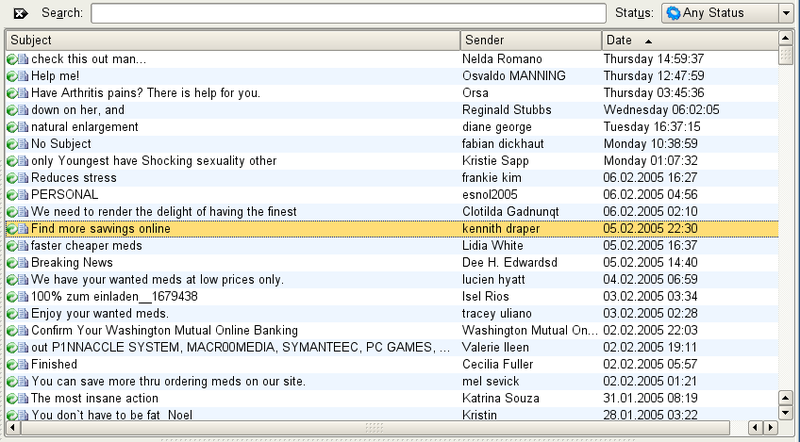 This feature permits the user to tag the specific emails and categorize them. Does the software allow to search for specific content present within emails as well as attachments? Yes, the user just has to define the search preference for the evidence in mail/attachment/both in the ‘Look For’ option. If the user selects ‘Search within Mail and Attachments’ option then the software enables searching within emails as well as attachments. Can I examine image file processed by the OCR technique with the help of Email Forensic tool? Yes, you can easily examine image processed by the OCR technique via the tool. To examine the OCR file, you need to change some settings of the software. For that, click Options > Processing Options > Check OCR option. Does the software is capable to export evidence in PDF file format? Yes, the utility permits to export emails and attachments evidence in multiple formats such as CSV, HTML, TIFF, PST, EML, Concordance, PDF etc. So, one can easily export evidence in PDF file format. Can I sort evidence items according to size and item count while using the software during the investigation? Yes, you can easily sort and filter the evidence list as per the name, size, custodian, item count, etc. with the help of Email Forensics tool. 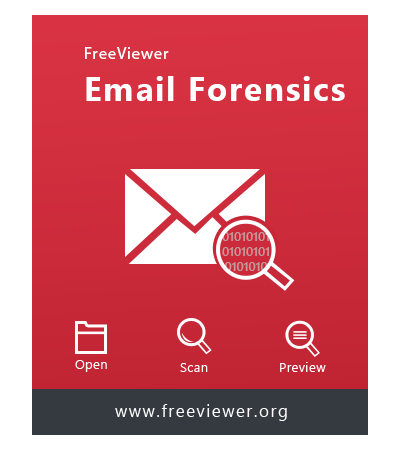 Email Forensics Tool is a top-notch software that permits users to preview, search and export emails from different email applications. Moreover, this multi-tasking software is loaded with a set of remarkable features that is been developed by the best technocrats exclusively for Windows operating system. 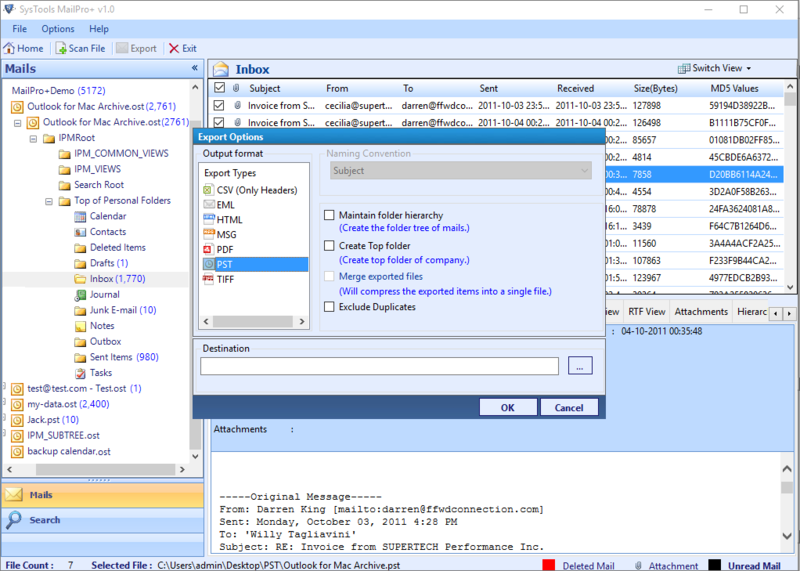 Install and launch the Email Forensic Analysis tool on your local machine and navigate the desired file from any email client that is to be exported to the desired file format. 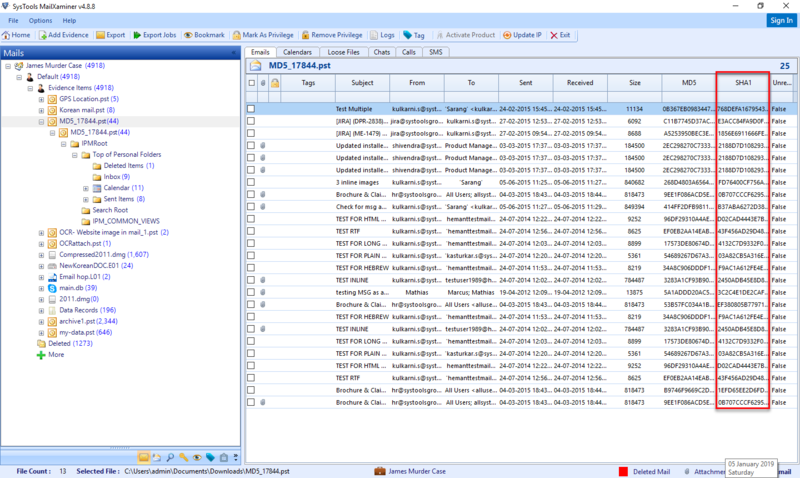 Once the files are uploaded on the software dashboard, the utility scans the email files with details like Collection Name, Created On and so on. While scanning, it also recovers the emails, which are corrupted, damaged or permanently deleted emails. Select the required format to export the email files into CSV, EML, HTML, MSG, PDF, PST or TIFF format. Apply different customized options and hit the OK button to initiate the export process. This Email Forensics software is a proven utility to preview and analyze the email headers precisely. It allows users to gather suspected data for evidence in one collection. If in case there arises a need to shut down the software due to some needs, then instead of investing the time again on re-scanning and analysis. One can simply make use of the data, which is been saved in the collection folder. Thereafter, a user can scan, search and examine all the emails in a single go. 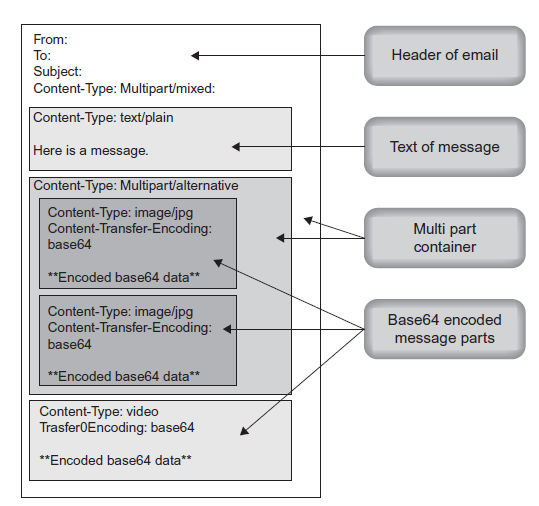 With the help of Email Examiner software, one can seamlessly analyze the email headers in different perspective. If the exact location of the file is not known then manually browsing every single folder from the file explorer will consume a lot of time. This utility provides the option to auto-search the desired email application’s data file by either selecting the drive or the entire hard disk to retrieve the exact email file within a short span of time. This Forensic Investigator tool is power-packed with a wide-range of distinct features that will definitely blow your mind. It is capable enough to open and analyze files irrespective of the file type and the email client from which the file belongs to. Henceforth, one can smoothly perform the analysis of multiple emails from same or different file types in just a few simple clicks. Some of the file types supported by the tool include PST, OST, OLM, NSF, DBX, EML, MBOX and so on. For the purpose of Email Forensic Analysis, most of the investigators undergo a tough time in knowing the email headers in detail. This can be made easy with this futuristic tool as it offers 9 different preview modes i.e., Normal Mail, Hex, Properties, Message Header, HTML, MIME and various different views. All these views will help to deeply investigate the data instantly. Additionally, it also ensures to reduce the analysis time by providing all the relevant details that are required to know the unauthorized activity done by the culprit. Instead of selecting and opening every single folder and its sub-folders, one can reliably make the best use of Show Recursive Listing of Emails option. As this will allow to view all the emails collectively which includes the main folder as well as the sub-folders under the top folder. In order to avail this option, simply right-click the main folder and select Recursive Listing option. By this, one can effortlessly search, analyze and export the desired email to the required file format. This Email Forensic Examiner tool let users to analyze the required emails by deeply searching the emails for evidence search. The tool offers different search filters that allows to separate emails by availing different parameters such as Subject, From, Received Date, Sent Date, Importance, Bcc, Modification Date and so on. By applying the various criteria’s, one can quickly search the desired data from the bulk data items. In case of viewing the emails with a specific date, then simply apply the filter and get the relevant emails in front of you. No doubt, opting this impeccable tool is always the best option as this tool enables a user to convert and save the emails from different email applications to different file formats. Some of the file types includes PST, EML, PDF, MSG, TIFF, CSV, HTML. Now, all these file types will allow users to export emails into any of these formats from any of the email programs. Moreover, this tool is developed keeping in mind all the requirement of the users, hence it offers all kinds of impressive features to ease the work. In order to prevent duplicate emails getting exported to the desired format, all you need to do is mark the checkbox corresponding to Exclude Duplicates option. In addition to that, this forensic examiner tool also maintains the folder structure exact to the order of the original file structure. Moreover, this feature is extremely useful for data analysis. One can also apply different naming patterns to the resultant file by availing the desired naming convention patterns from the given list of options. The Email Forensic Analysis tool creates a report in CSV file format after undergoing the scanning, analysis and export process. 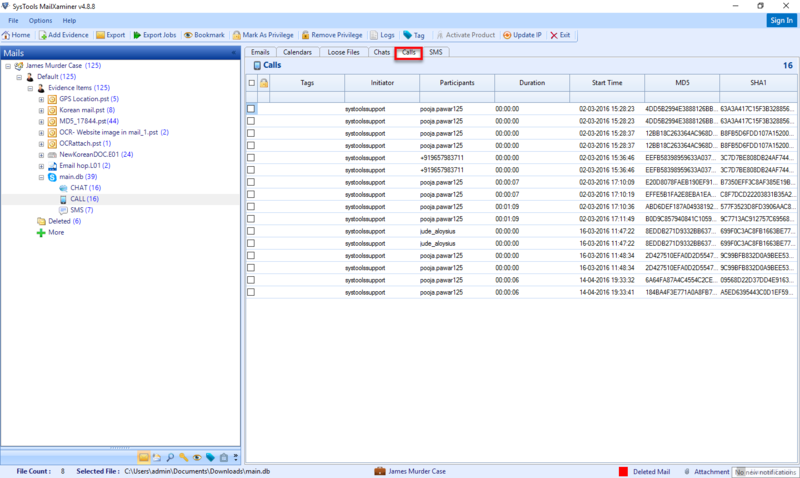 It includes different details such as success count, source file path, fail count, export status, etc. Moreover, it also provides the option to save the export report, which can be used for future reference to check the count of the emails exported and the number of failed emails, etc. This exporter tool is completely safe and easy to be installed on your Windows machine. It also renders a confidential environment with an easy-to-operate interface to flawlessly analyze the email headers without revealing the evidence to any unknown person. Apart from that, this software is highly rated by most of the experts that provides a set of result-oriented features to easily deal with all kinds of major email application’s data file. 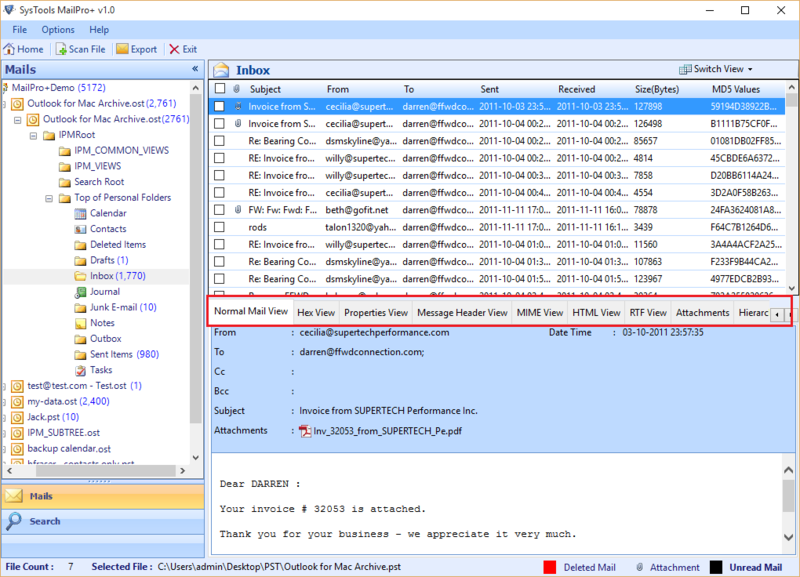 Is this tool require to install Outlook application to analyze the PST emails? 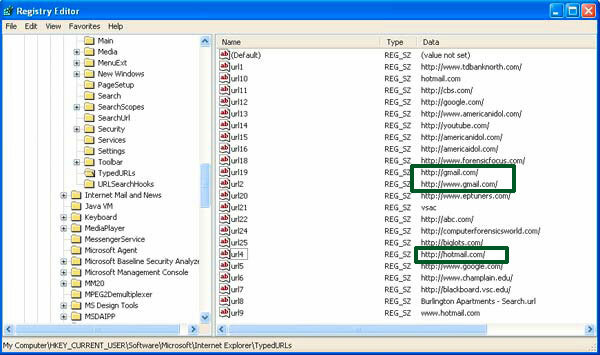 No, this independent Email Forensics software can be easily operated without installing Outlook application on the system to view the data from the PST file. Does the tool allow to read MD5 value of the emails? This Email Forensics Software allows users to view the MD5 value of all the loaded emails. 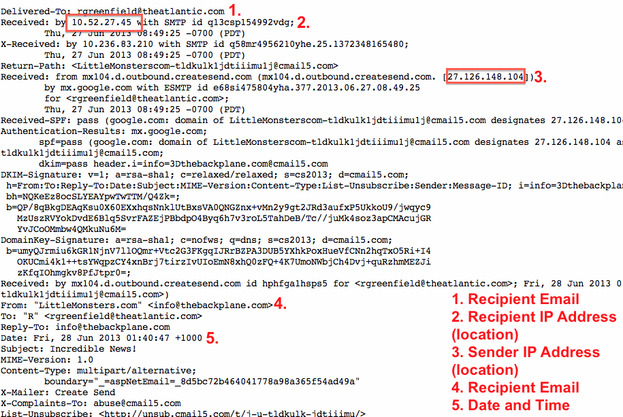 Moreover, it lists entire emails with attributes like Subject, From, To, Sent, Received, MD5 Value, etc. 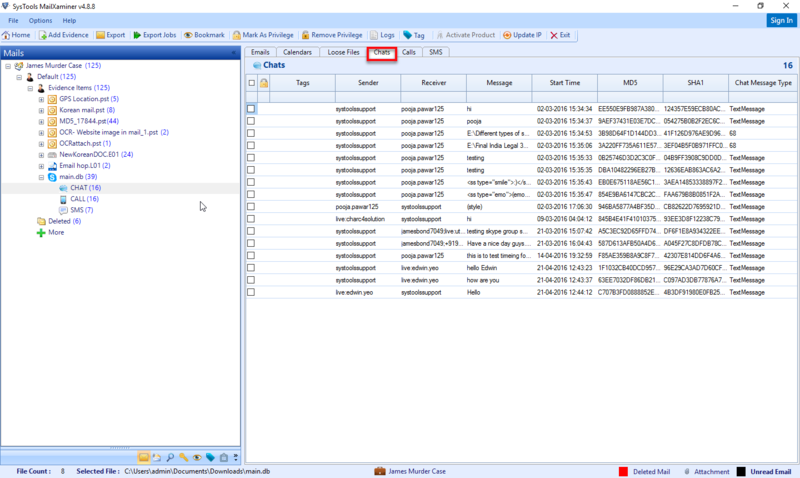 Why is it not possible to view the contacts & calendar data of the scanned PST file? It is not designed to view contacts and calendar data from the PST file. Basically, this software is designed to scan, view and export only the email data from different email programs, which can be further converted to other file formats. It is exclusively designed to analyze and examine emails, which can be also used for forensic analysis purpose. Is this utility capable to view the permanently deleted emails from the NSF file? Yes, this is because the tool performs a rigorous scanning process of the selected NSF file. During which, it recovers all the Shift+Deleted emails from the Lotus Notes NSF file. Plus, it is also capable to recover corrupted or damaged emails from the email application’s data file. Is there any limitation to the number of collections that can be created via this tool? No, it does not pose any such restriction to the number of evidence collections that can be created using this ultra-quick software. Moreover, you are allowed to create unlimited collections comprising of unlimited files of any file types. What are the different email clients that is supported by this tool to view, search and export to another file format? With the help of this Email Forensics Investigation tool, one can export email data from multiple file formats, which belongs to these desktop-based email programs i.e., Outlook, Lotus Notes, The Bat, Outlook Express, Thunderbird and many more. Is this utility performs an advanced search to fetch some emails out of my bulky Outlook PST file? Yes, this tool is efficient enough to perform a deep or a thorough search by specifying some relevant details in the given criteria fields. As this will allow the user to easily navigate the desired file, which is to be exported to the resultant file format. Is this tool can be operated in Windows platform? If yes, then what are the different Windows OS supported versions? One can seamlessly perform the scanning, searching, investigating and export process with the help of this trustworthy utility. Moreover, it can be easily operated on the latest Windows 10 operating system and all the previous versions. Receives emails from the sender. Validate source and destination addresses. Sends and Receives emails To and From other SMTP Server. 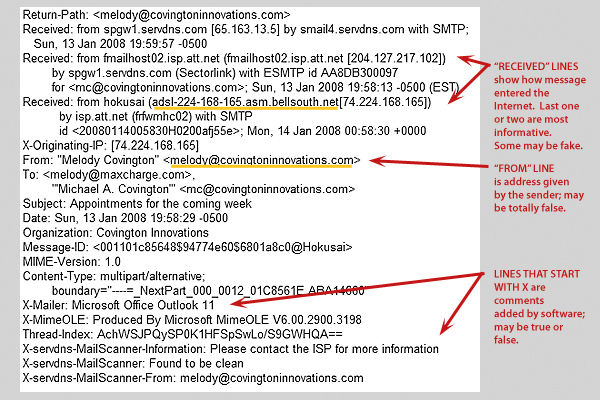 User/Email Client/ Webmail use SMTP to SEND the intended email. 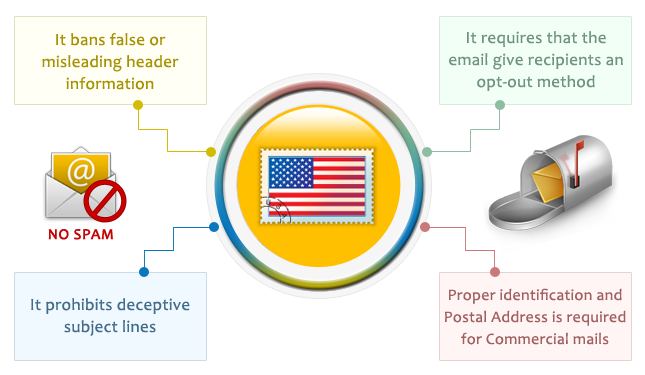 POP3 Server: It is an incoming mail server that helps the user to RECEIVE the email residing in its e-mailbox. POP3 Server Deletes the email from its server once user's email client download the particular email. IMAP Server: Incoming mail Server exhibits same functionality as of POP based server but retain copy of email even after user downloads the email. SMTP protocol governs the email system language [as specified in RFC2821]. 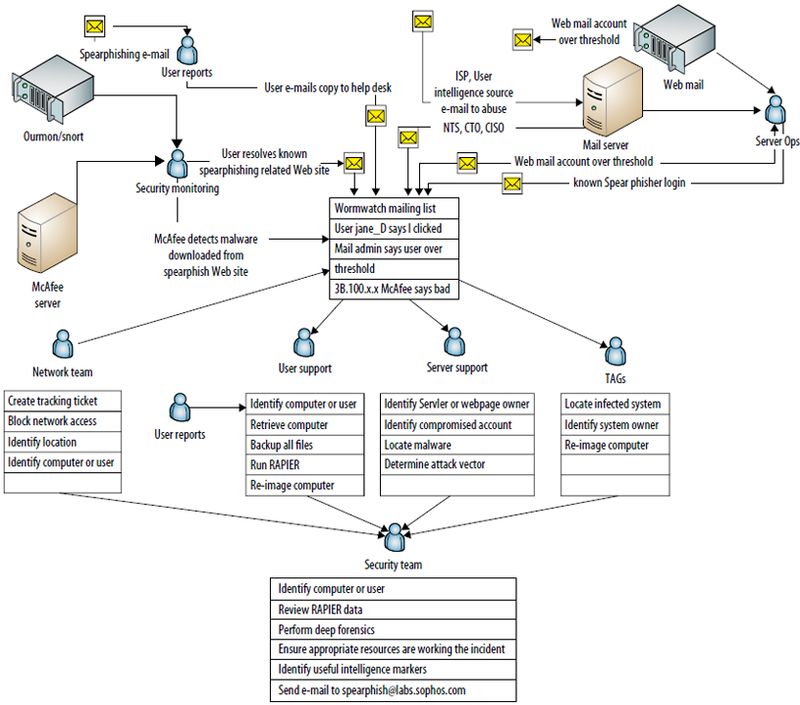 The process of SMTP client [application (MS Outlook)/webmail (Gmail)] making a request to SMTP Server (e.g. MS Exchange) and the server responding back to the request with acknowledgment code. 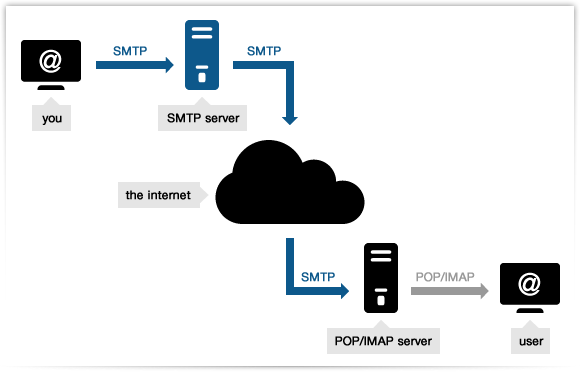 Note: SMTP Server becomes SMTP client when it transmits email to other SMTP server. EHLO or HELO: SMTP Client identifies itself to SMTP server with this command. MAIL FROM: This command tells the Server the source of the email message (sender). RESET: SMTP Client asks the SMTP server to abandon the current transaction. VERIFY: SMTP client ask the Server to verify a user/mailbox. EXPN: SMTP client ask the Server to confirm the mailing list and after confirmation should return membership of the list. HELP: The client asks the server to send helpful information. NOOP: this SMTP protocol commands request the server to send an "ok" reply. QUIT: this command tells the server to send an "ok" command and thereafter terminate the transmission channel. 221: Server closing the transmission channels. Header contains several lines of header information also known as fields. Each field itself is divided into three components. The header fields in general are written from bottom to top hence the best way for the email forensics investigator is to analyze all those fields from bottom to top. 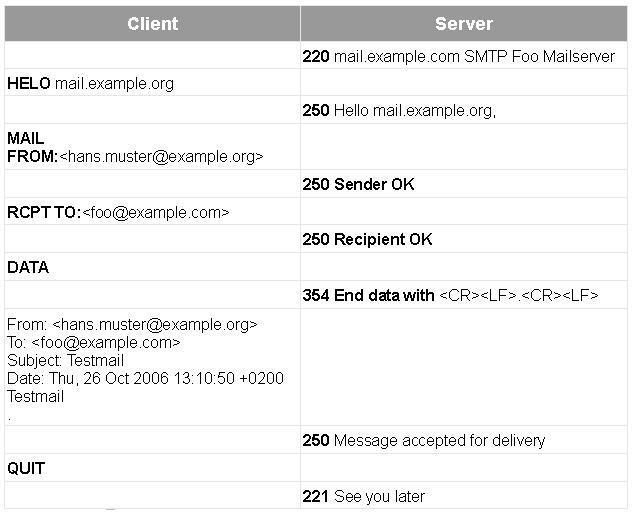 So whatever is done initially by the sender's client/server during the composition and sending of email those fields will be located at the very bottom of the header part of the concerned email. 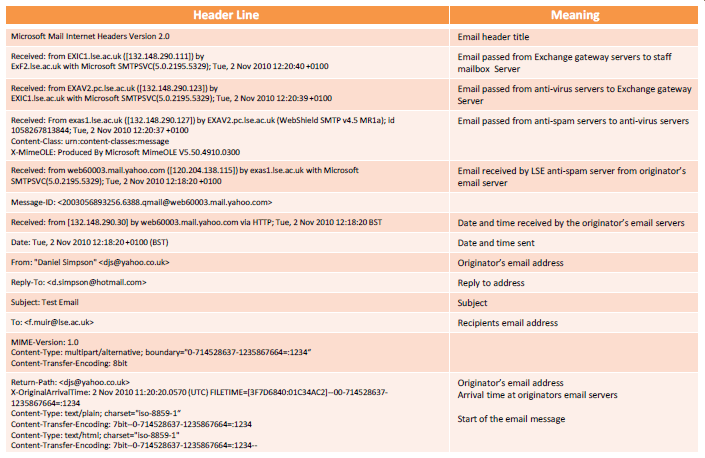 Various X-header information added by different SMTP server and email clients during the whole email sending process. 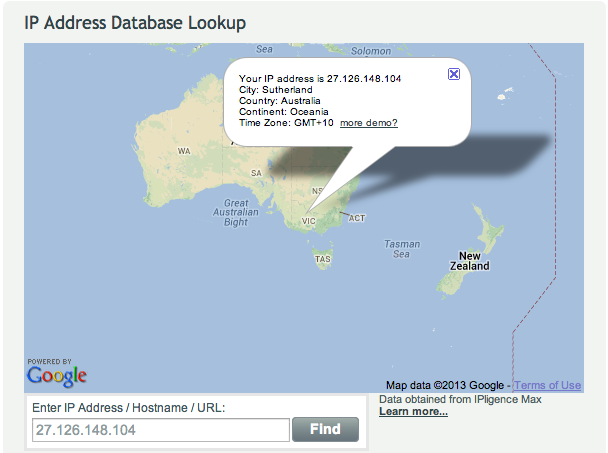 A simple DNS lookup after finding the source ip (26.126.148.104 in this case) will reveal the server location, as one can see in the image as well. Trace the origin of the concerned email. Present the case in admissible format. 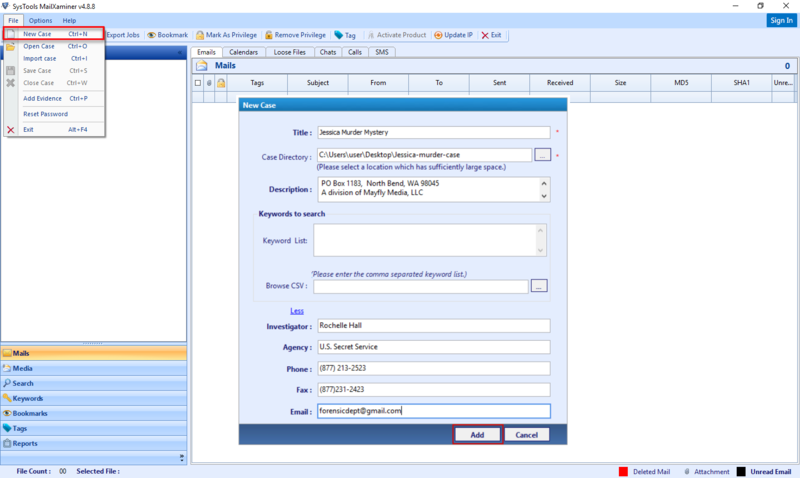 Email clients such as Outlook, Entourage are standalone applications installed on users computer designed to send, receive and organize emails. Window Search Index: There will be time when emails files are scattered and when doing search in Gigabytes of data it becomes hard to locate all the emails. 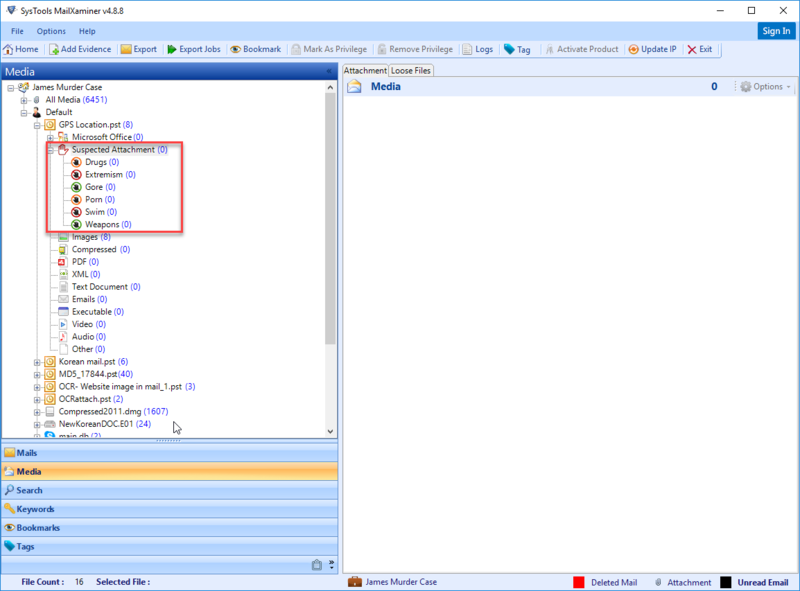 When performing email computer forensics the investigator can use the Window Search Index features to locate the email files. 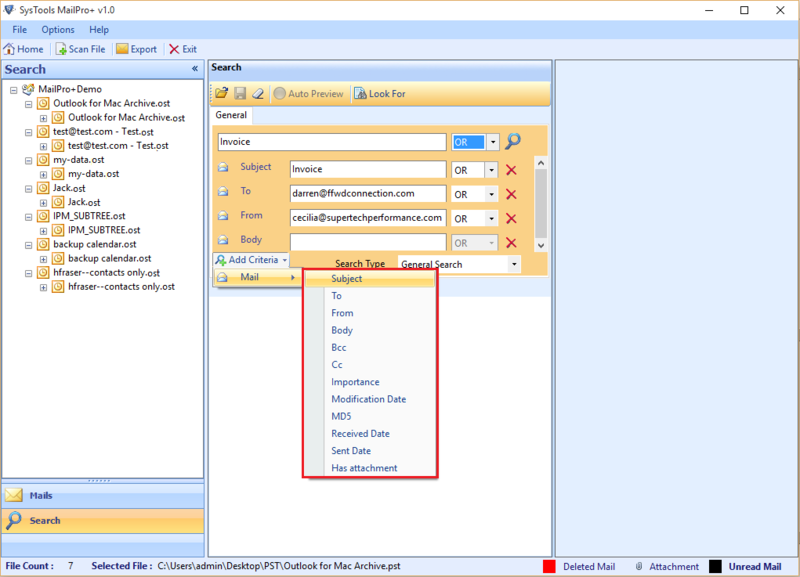 Window search index maintains a record any document/application on the computer including the content of the files hence with right keyword and file type search you will be able to locate all the emails indexed by Windows Search instantly. Windows search will greatly help in computer forensics of email as you can sort the document type that you are interested in KWs you are looking for and extension to search. By combining all the parameters you will be able to easily get all the email that exists within the disk/drive. Network Status: Almost all laptop/Desktop comes with pre-installed NIC Cards (Network interface cards) and provides interface to the host machine with the outside world (network) and can play significant role in email forensics. Many web based email service provider records the IP address of the originating system from where the email was composed and dispatched to the receiver. Ipconfig command will help you to locate all the NICs on the computer. Parsing Process Memory: Processor memory (RAM) also holds key information and one might get useful information such as IP and email addresses if one is able to parse through the content of RAM Dump. Internet Explorer: During your forensic search for emails in computer system you can use the data stored by internet explorer to know a bit or two about the emails such as which email provider the user usually logins to and most frequently site visited. Internet history records that usually does not get cached by the browser. Though the majority of critical component you will find in the data you collected that reside in the persistent storage medium, you will be able to capture invaluable evidence to reconstruct the event. Email Spamming: In simple term it can be defined as sending unsolicited emails. Email Spammers generally obtains the email ids from webpages, DNS listing and every other possible source and send unsolicited emails to the gathered email database. Mail Bombing: The primary intension of mail bombing is to cause denial-of-service attack to the victim by sending huge volumes of emails to the victim's mailbox/server to crash down. Phishing: It is criminal act of sending an unsolicited and illegitimate email falsely claiming to be from legitimate site/company in order to win the victim's trust and acquire their personal/account information by redirecting them to fake webpages of the trustworthy sites and asking them to input the data. Email Spoofing: is the act of forging the email header so that the message appears to originate from source other than the actual source. The perpetrator might attach Trojan, virus or warm files as attachments file in the email. Email Sphere fishing: In this email fraud the perpetrator will ask for confidential and sensitive information. This type of attack resembles with e-mail spoofing fraud but in here in almost all cases the sender is someone trustworthy with an authoritative position in the organization. 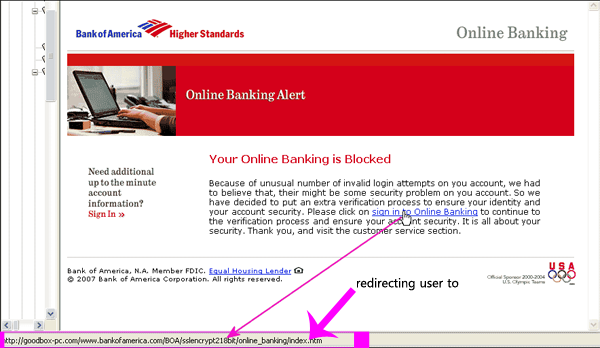 URL (if any) the email is prompting the user to visit, this url will also revel the domain the perpetrator used to lure the victim. Check the Whois for further information. Received Field to identify the originating IP address or at least the SMTP server of the sender. The CAN-SPAM Act of 2003 establish requirements for those who send commercial emails, spells out penalties for spammers and companies whose products are advertised in spam. 18 U.S. Code § 2252A & 2252B: This law prevents and punishes the culprit in cases concerning crimes that have been committed using the digital means. This law also takes care of the Email Malpractices. RCW 19.190.20: This law governs to the resident of Washington and prohibits any person from commercial transmission of electronic mail messages. Stored Communications Act (18 U.S.C. §§ 2701-12): This act protect the owner's file content that are stored by the service provider from any unauthorized use failing which there are many civil and criminal penalties for the act hence the forensics expert need to submit specific proof before a court order or search warrant can be issued against the alleged person. Email Analaysis of Emails in Multiple Views : Normal, Message Header, HTML, RTF, Hex, MIME, Property, Email Hop view, Attachment views. Step 2: Three Modes : Single File, Bulk Mode & Find Option to Load the desired file into the software. 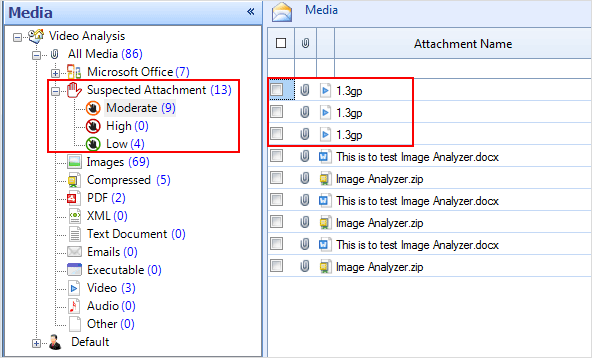 Step 3: Preview all the data alongwith attachments within the software Interface.